Rotary Club of Bangor would like to thank everyone for participating in the Parade this year. Thank you to our many volunteers that helped make the parade possible. Thank you to the downtown businesses that added festivities to the day and made their facilities available for this event. Thank you to the Bangor Police Department and the Public Works for all of your hard work and help. We had 83 floats participate in the parade this year. The weather was excellent. Approximately 16,000 spectators in attendance. The judging results are in and the Trophy winners are as follows: Congratulations! Outstanding Adult Group – Eastside Center for Health & Rehabilitation, LLC. Trophy winners please contact Roland Narofsky at rnarofsky@mainesavings.com to make arrangements to get your trophies. Looking back on a year of service, and looking ahead to new leadership, President Greg Choquette says 'Thank you' and welcomes in Bev Uhlenhake as our new President. In recognition of Rotary Club of Bangor’s 100th year of service to the citizens of Bangor and surrounding communities, Rotarians are participating in several community service projects each month throughout 2017 to commemorate the club’s centennial year. Music Off Broadway: A Centennial Celebration! Festival of Lights Parade a Success! Rotary would like to thank everyone for participating in the Parade this year. Thank you to our many volunteers that helped make the parade possible. Thank you to the downtown businesses that added festivities to the day and made their facilities available for this event. Thank you to the Bangor Police Department and the Public Works for all of your help. 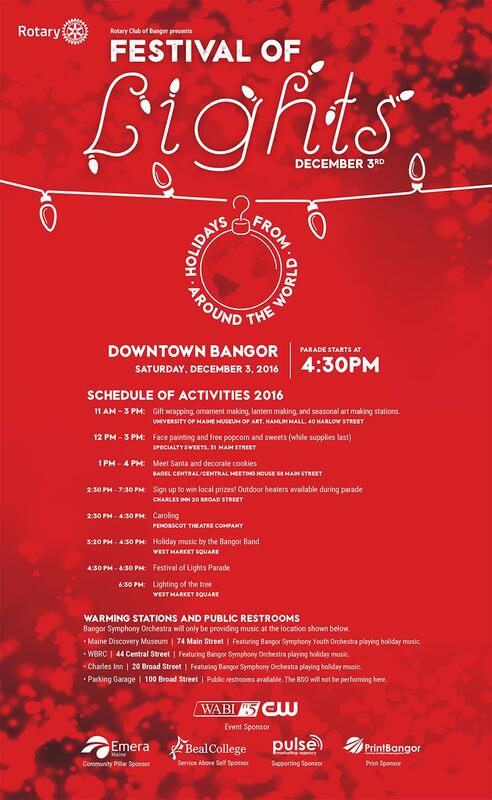 The Rotary Club of Bangor will host its annual, Festival of Lights Parade, on Saturday, December 3, 2016, beginning at 4:30 pm along Main Street in downtown Bangor. 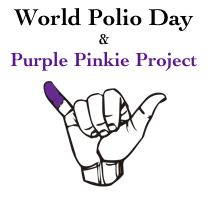 The Rotary Clubs of Bangor, Bangor Area and Old Town are joining forces to host the Purple Pinkie Project celebration during the month of October in recognition of World Polio Day, which takes place Oct. 24. 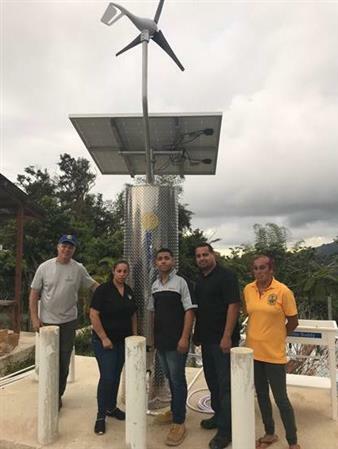 All activities are meant to raise awareness of Rotary International’s efforts to eradicate polio worldwide and to raise money -- $1 at a time – to go toward that global effort. Polio Eradication - "You can do it"
After 30 years of hard work, Rotary and it's partners are on the brink of eradicating this horrible disease. A strong push is needed now to root it out once and for all. It is a window of opportunity of historic proportions. 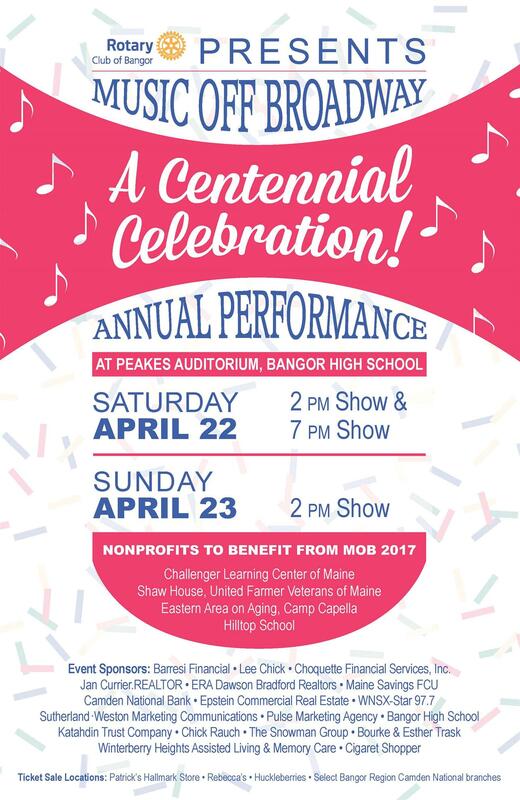 The Rotary Club of Bangor is scheduled to present its 8th annual Music Off Broadway production on Saturday, April 13 at 7:30 pm and Sunday, April 14 at 3 pm at Bangor High School’s Peakes Auditorium. This year’s theme is the Magic of Motown: The Start of Country and Rock. On September 21st, The Rotary Club of Bangor hosted it's first River Boat Cruise on the historic Penobscot River. Five local high school graduates received Youth Merit Scholarships from the Rotary Club of Bangor during its weekly meeting on June 7. The Bangor Rotary hosted its annual, Festival of Lights Parade, on Saturday, December 4, 2010, along Main Street in downtown Bangor. The parade was a great success! On June 22, 2010, the Rotary Club of Bangor presented the Charles F. Bragg 2nd Rotary Club Leadership award to the first recipient Charles F. Rauch, Jr.